RK3288 by Rockchip -- Ubuntu arrive ! Futur SOC des futurs "MINIX X9", "JXD 8800"... ? We were expecting some new processors at CES 2014, but this CES turned out to be mostly disappointing, and the vast majority of reporters present at the conference, do not seem interested in covering Chinese SoC vendors. Some information however surfaced on several foreign languages blogs and news sites about Rockchip RK3288. First, RK3288 is indeed based on ARM Cortex A12 as initially announced, and not some mysterious ARM Cortex A17 cores, but somebody at Rockchip likely made an embarrassing mistake, and Edward Weinert reported it was corrected at Rockchip booth with pieces of paper as shown below. So Rockchip RK3288 has four of these Cortex A12 core, a 4L2K H.265 / HEVC video decoder, and an high-end Mali T764 T624 GPU supporting OpenGL ES3.0 and OpenCL 1.1 that vastly outperforms Mali-400 MP4 found in RK3188, and is even significantly faster than Adreno 330 GPU found in Qualcomm Snapdragon 800 SoC in Kindle Fire HDX. The first column is probably AMLogic M802 with Mali-450MP6. If you upgrade from RK3188 to RK3288, you’ll get 4 to nearly 6 times more 3D graphics performance based on GFXBench benchmarks. The company did not include the CPU performance, as Snapdragon 800 will clearly have an edge in this area. The maximum frequency for RK3188 is 1.6GHz (despite being told it would go up to 1.8 GHz at launch), whereas RK3288 can be clocked up to 1.8 GHz, and moving from Cortex A9 to Cortex A12 improves performance from 2.5 DMIPS/Mhz to 3.3 DMIPS/MHz, meaning RK3288 is nearly 50% faster, in theory, compared to RK3188 when it comes to CPU performance. We’ll have to get more benchmark results to get a complete picture of the performance, but we already know CPU performance should be pretty decent, and GPU performance be top of the class. RK3288 is said to cost about $40 for now, with the price probably coming down to $35 in the second quarter. One of the first devices with RK3288 SoC will be allegedly be Yuandao M12 tablet. Belle évolution, surtout côté GPU, et voilà qui donne une sacrée claque à MTK et son MT6592 à peine sorti. J'espère que les fabricants de consoles ne vont pas gaspiller cette puissance dans des écrans à la résolution inutilement démesurée comme ça devient la mode sur les smartphones et les tablettes. Seules les tablettes s'en sortent mieux avec des batteries bien plus conséquentes. Malgré tout, quand on a eu l'occasion de passer un peu de temps sur du 2k, il semblerait qu'il devienne très très difficile de retourner sur des résolutions moindre. Perso, sur du 5 pouce, entre du 720p et du 1080p je ne vois pas de grosses différences, peut être que ce n'est pas la même chose sur des écrans plus grand ? il est vrai qu'une tablette open source 7 pouces en 2k je veux bien essayer ! So with the release of the RK3288 later this month, Rockchip is putting the big guys on notice. They will not only be first with the new ARM CPU cores and GPUs, they will be the only player SemiAccurate knows of with a full hardware H.265 implementation. If the early rumors SemiAccurate moles are whispering in the background are true, the RK3288 is not only going to be a damn fast part, it will be a decently priced damn fast part with one pretty amazing and unique video decoder. Keep an eye on the RK3288, everyone is saying Rockchip did a great job with it. Manque quand même un élément de taille ... C'est bien de dire qu'on a la plus grosse, mais il manque quand même la consommation de ce CPU et sa gestion de l'énergie. Inutile de faire un truc qui carbure avec 200W en entrée ! Geekbuying a posté cette info puis supprimé, pour quelles raisons ? Minix has been silent for too many months without blast new product off. Today is 2014.02.27, now it is a warm afternoon in ShenZhen, i sit in the work office of Geekbuying,wondering what will be next generation milestone product and what the name would it be.At this time 2 words comes into my mind,one of them is X9 while the other is RK3288. After selling MINIX product for so many times, i realize that MINIX loves odd numbers instead of even numbers which is a BIG guess from myself.So i think the next generation product will be named MINIX NEO X9. This is a stupid question as MINIX will 200% use Rockchip chips, they two like brothers, one can not live without the other, fighting with each other everyday but love each other more and more. RK3188 is a super great chip but it will be too old and powerless for the next generation (leave alone rk3188t, it is a tragedy). 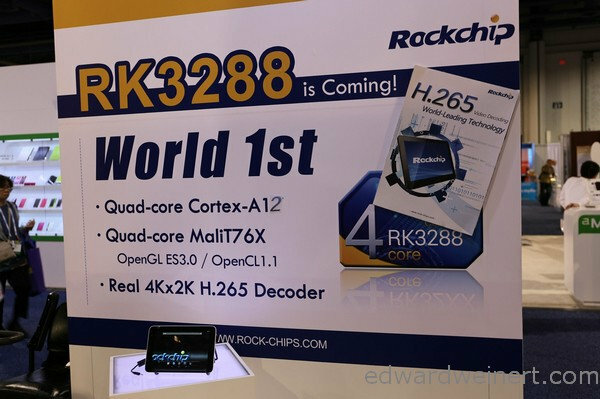 The latest chip from ROCKCHIP will be RK3288,everyone knows this after CES 2014. What is the performance of RK3288 ? you can google it then you will find a lot of compare with rk3188 and other cortext A9 chips. it would not be so hard to find out how powerful it is . As the biggest partner of MINIX, we geekbuying will not say this news is released from MINIX, they do not anounce such news before new product is well produced and updated. BUT,guys, we geekbuying will sell the first piece MINIX NEO X9 out, we will got the first 500 pieces or 1000 pieces MINIX NEO X9 in the world before all the other Chinese website.This happend while MINIX X5 and MINIX x7 were released and it will happen again on MINIX NEO X9. I will not tell you the stock date is within 2 months because i am not sure about this , seriously, i trust and believe that MINIX will not let us down. The latest Rockchips R3288 processor with integrated 4G LTE network support is rumoured to make it’s first appearance in tablets from April this year. Rockchips are quite proud of the RK3288, and tablet fans are excited as this is this is one of the first quad-core Cortex A12 SoC device to to on the market. The processor also happens to have a rather potent quad-core MaliT76X GPU, giving enough graphics performance for full H.265 decoding meaning 4K video will soon be a reality on your tablets. 4G LTE is also going to be supported by the new SoC making up for quite a capable processor. Now all that needs to be seen is which tablets are going to be getting the processor first and will this mean the first 2K, 4K tablet displays are also going to be appearing in the coming weeks? The q88 as far as I know will have different versions, including IPS screen and RK32XX when it's available. 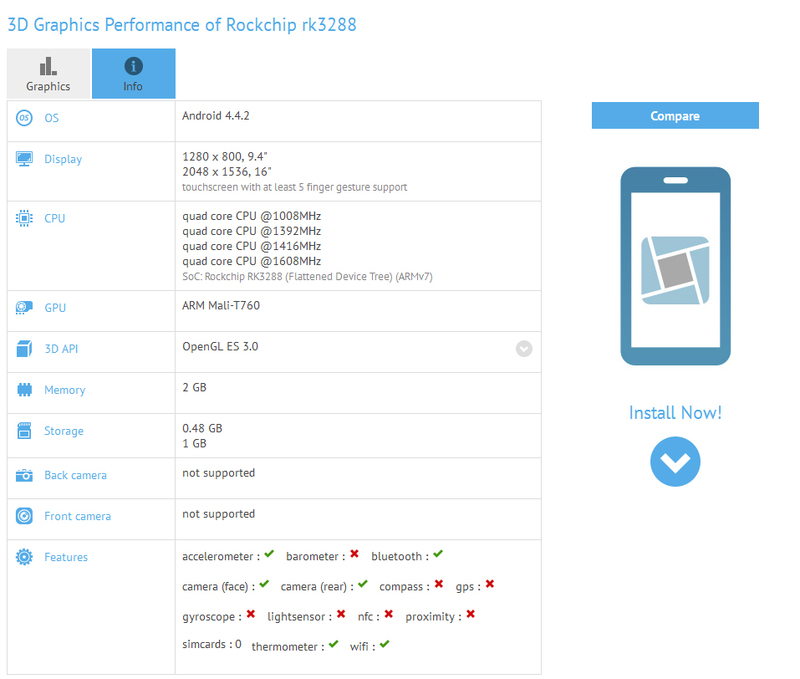 Rockchip’s new RK3288 processor is a quad-core ARM Cortex-A17 processor with ARM Mali-760 graphics. It’s the most powerful processor from the Chinese chip maker to date, although at the rate Rockchip releases new processors that probably won’t be true for long. Anyway, the first RK3288-powered tablets started appearing a few weeks ago. Now the first Android TV boxes sporting the chips are starting to show up. Vendors are starting to take orders for set-top-boxes and TV sticks at Chinese business-to-business marketplace Alibaba. If you don’t want to order 500 units, you’ll probably have to wait a little longer to get your hands on one of these little guys. This TV stick measures 4.3″ x 1.6″ x 0.5″ and looks a bit like a big USB flash drive. But while there’s a USB port on one end, there’s an HDMI connector on the other. Plug the stick into your TV or monitor and you can use it to run Android 4.4 KitKat on a big screen. The device features Rockchip’s 28nm ARM Cortex-A17 processor, 2GB of RAM, and 8GB of built-in storage. There’s a microSD card slot which supports up to 32GB of additional storage, a micro USB port for power, and 2 USB 2.0 host ports. It supports 802.11ac WiFi, Bluetooth 4.0, and HDMI 1.4A. 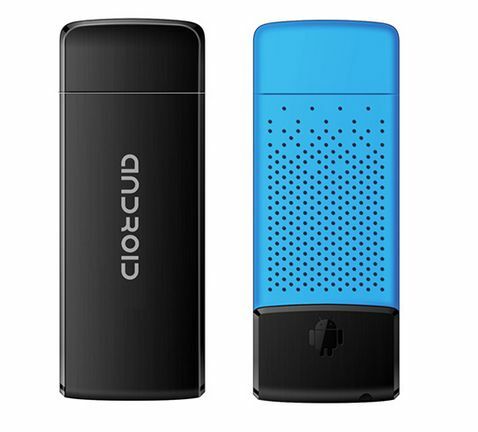 This model is a bit bigger and looks more like a WiFi router than a flash drive. 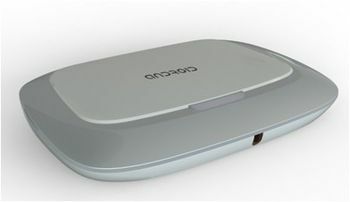 It measures 5.6″ x 4.3″ x 0.8″ and has room for a few more features including an external WiFi antenna and an Ethernet jack. Other specs are pretty much the same as those for the smaller model, including 2GB of RAM, 8GB of storage, WiFi, Bluetooth, and a microSD card slot. Both product descriptions mention support for 8K video input and 4K video output and support for H.265 video. 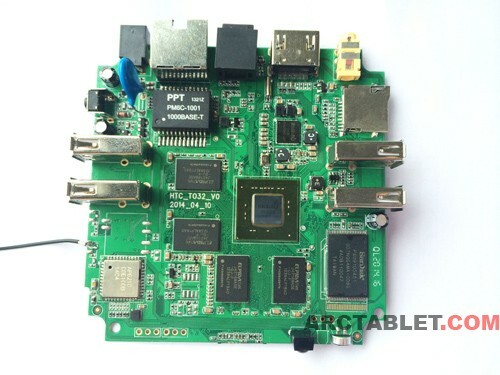 Rockchip RK3288 processor is not far away and the first Pipo tablets are expected to ship with it before end of this month. 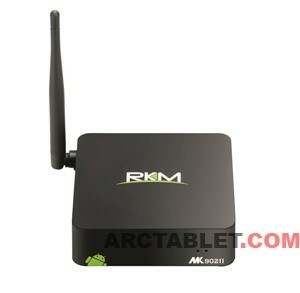 The RK3288 is based on the ARM Cortex A17 architecture and it’s a quad core setup with speeds up to 1.8 GHz. As a GPU we have the Mali T760 graphics chip which is scalable up to 16 cores, with H.265 hardware decoding and also support for 4K x 2K resolution. 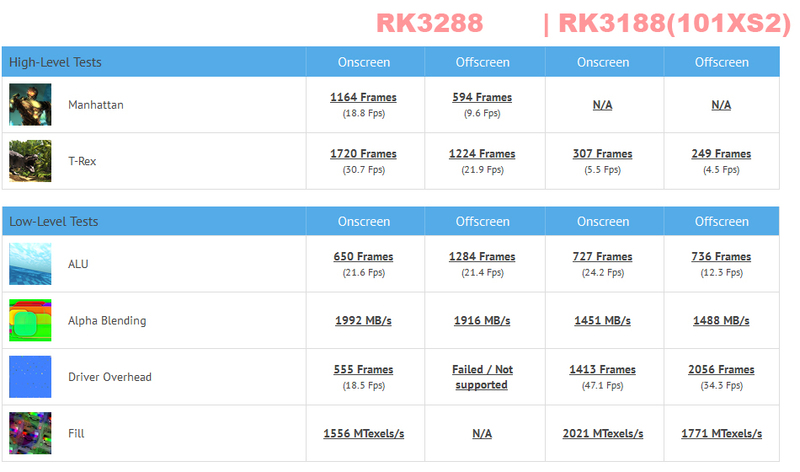 On GFX Benchmark, we were able to find benchmark results that look like they are coming from RK3288 developers platfrom. In the high-level T-Rex test we can see a huge improvement of a few hundred percent, while the results for the low-level tests are not much different. Overall, we can conclude that the RK3288 will bring a big 3D graphics improvement over the RK3188 and will be able to compete with high-end Qualcomm Snapdragon 800 CPU. However, when it comes to raw CPU power, the Snapdragon 800 still has an edge in that area. Pipo has been among the fastest rising Chinese tablet manufacturers, ever since the company hit it off with dual-core RK3066 tablets in 2012 for 2014 a new range of RK3288 tablets to launch. Sources reveal that the company is now looking forward to releasing a slew of tablets powered Rockchip’s latest quad-core solution, the Rockchip RK3288. 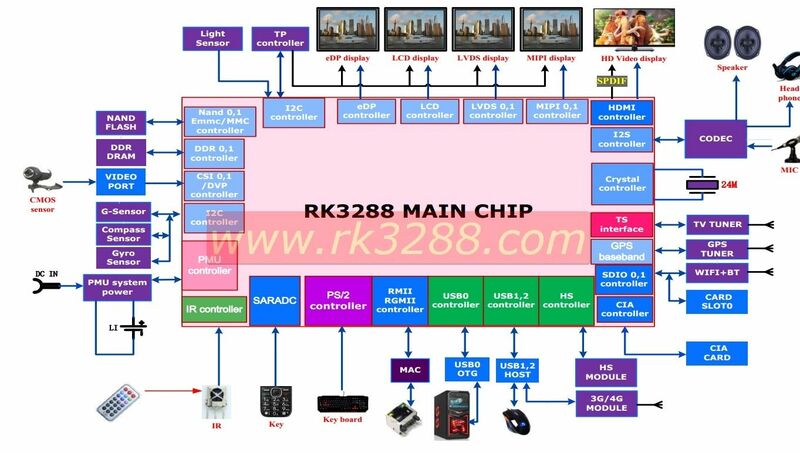 The RK3288 series succeeds the hugely popular RK3188 lineup of chipsets, and is expected to bring improvements in all aspects. The CPU now operates at a 1.8GHz frequency with 4 Cortex A17 cores working in tandem. 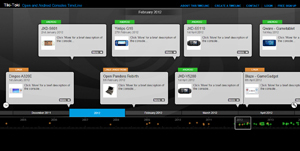 Graphics are provided by the ARM Mali T-760 chip, which again promises a huge jump in performance. Pipo will be showcasing multiple devices with the usual screen sizes for tablets in 8.9 inches, 9.7 inches and 10.1 inches. It isn’t very clear at the moment, but the tablets will have resolutions higher than or equal to 1920 x 1080p at least, with some possibly going up to 2560 x 1600p. What’s more, the powerful GPU on the RK3288 will even allow you to playback 4K video! We’ll know more about these power-packed tablets during the Hong Kong Electronics Fair, which is scheduled to take place next month. 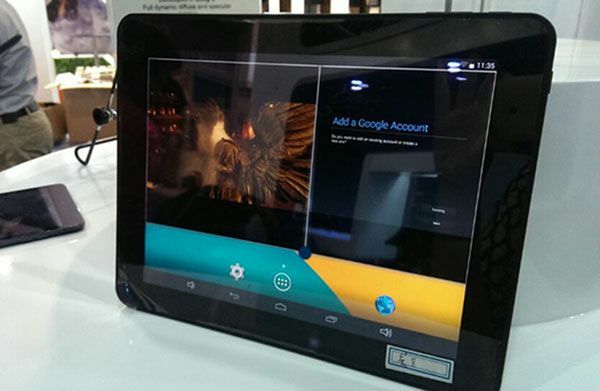 Rockchip’s RK3288 processor is starting to show up in Android-powered tablets and TV boxes. Now Rockchip is also showing off a prototype of Chromium OS running on a system with its new ARM Cortex-A17 quad-core processor. Chromium OS is the open source version of Google’s Chrome operating system. Rockchip says the ARM Cortex-A17 processor offers strong enough performance to open up to 30 Google Chrome browser tabs at once. 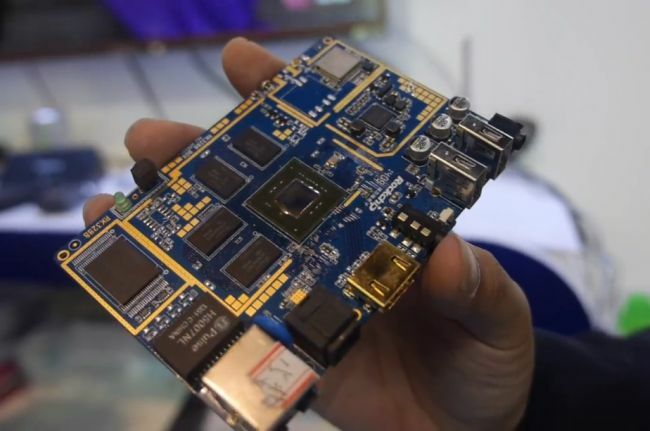 The RK3288 chip features ARM Mali-T764 graphics with support for 4K video and H.265 video decoding, and when ARMDevices caught up with Rockchip at the HKTDC show in Hong Kong this week, the company was showing devices powering 4K displays. Rockchip is also showing a handful of Android tablets with the new RK3288 chip, featuring cold boot speeds as short as 8 seconds. The Rikomagic MK902 MiniPC, a quad-core set top box equipped with a 5 MPixels camera (under review here) should soon get updated with latest Rockchip RK3288 processor. The MK902II is expected next month, price has not yet been set. LAN Ethernet – RJ45 Supports Gigabit network. As it appears on the Rikomagic MK902II board sample below, the form factor and connectors implantation seems to be identical to the MK902. The main changes on the second version relate to a major CPU upgrade with the Rockchip RK3288 processor (visible in the center of the picture) and a LAN improvement with Gigabit speeds support. The missing feature of a power switch from the MK902 does not seem to have been corrected. Visit us again for more information on the Rikomagic MK902II. Msg n°26 Sujet: Re: RK3288 by Rockchip -- Ubuntu arrive !